It’s been one week since the operation to remove the titanium plate from my jaw. This is how I looked on Sunday, the day I came home from hospital. 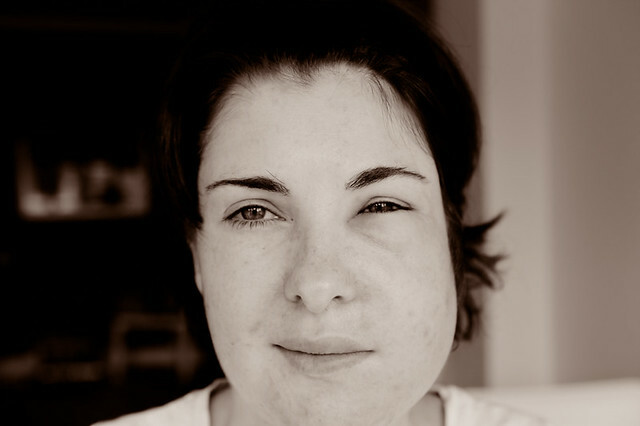 The monochrome hides quite how awful I looked, but let me tell you the skin around the left eye was yellow and puffy. By Monday morning, my eye was swollen shut. It took several hours for the swelling to go down enough for me to see out of the eye. While the area around my left eye still swells overnight, it is markedly improved. The anaesthetic knocked my sleeping around again. I was too tired to function, but not sleepy at night and I lay awake for hours. Bless Steve Jobs’ cotton socks for the iPad. And bless whoever invented painstop, the children’s pain medication with a sedative. I used to take it instead of Panadeine Forte back when my jaw was wired shut. It has done the trick over the last two nights and I am feeling much more human. I’m still taking two lots of antibiotics and Panadeine Forte/Painstop. Those prescriptions finish up today or tomorrow. Each morning, we remove the tape over my new neck dissection wound and Darren cleans and re-tapes it. Tomorrow, we head out to the hospital clinic to see my surgeon, Dr P, and find out what’s next. Question… How do you feel about photos of the operation? I have some photos from this operation. (I must bug him again for the photos from the big operation last August.) Would you like to see them? They are not for the faint of heart. I was thinking I could put them up on a separate page on this blog and you would have to click through to see them. No surprises on the main page when you are bleary eyed with your morning coffee. Promise. You are looking great! I had a free flap surgery done to reconstruct my left mandible after radiation damage and just met with my surgeon yesterday about removing the titanium plate. I was happy to find your blog and thank you for sharing your journey. I didn’t have ameloblastoma, I had squamous cell carcinoma but I have not met anyone even close to my age(27 at time of surgery) that has had a similar surgery. You are doing great and I look forward to following the rest of your journey. The body heals in amazing ways! I can’t wait to compare this photo to one from next week! I know there will be dramatic improvements. I hope this recovery continues to go well for you. I’m thinking of you ALWAYS! I would actually find it very interesting to see photos that you have from your surgeries. Definitely let me know if you decide to post them. So good to hear you are improving and managing the pain, the i pad sounds like an allround boredom beater, good to engage some of your brain away from pain and discomfort. I would be interested to see pics of the operation, I am sure there are some of us who used to watch the surgical docos on tv (your life in their hands ?) and won’t be upset by the images. It’s like looking at 2 different people. Least you know what you would look like if you ever get really fat! Glad to hear you are feeling more human. And yeah, good idea to put op pics on a separate page. Yes, the two sides of the face look like different people, but already this is reduced, from what I saw this morning. Letty, I have a photo of Kirsten not long after she returned from living in France in 2000-2001. When she walked down the ramp, I missed her totally. It is amazing what brioche from brekkie can do to a body! I, too, vote for the photographs being published in the reference pages of your blog, Kirsten. @Amanda – Thank you, I do feel ok but I am still looking rather average. Getting the plate removed is nothing on the fibula free flap surgery (as I experienced it), but I am glad to have it behind me. I’m glad the blog helped. @Margaret – They don’t bother me at all and you’re right, those sorts of TV shows have probably inured many of us to the blood and gore. I’d be interested to see your op pics; I’m surprised that they will do this for you. Is that included in the gold class package? @El – I think the photos are included in the waiver I signed saying they can use the photos of my innards for all sorts of crazy purposes. That was my choice, I should add. If they can learn from my surgery photos or educate upcoming surgeons with them, I’m all for it. Kirsten, I found you. I don’t think I have even blinked in the last half an hour reading some of your incredible story. Normal people going through extraordinary things. You’re amazing.